Canadian landscape artists Cam Forrester, Greg Hargarten, Paul Trottier, Roger Trottier and Ken Van Rees, also known as the Men Who Paint, will be hosting a showing of new paintings October 24th and 25th at Venu at Federation des Francophone, 212-308 4th Avenue, Saskatoon. The Artist reception will take place Friday from 7pm - 10pm. 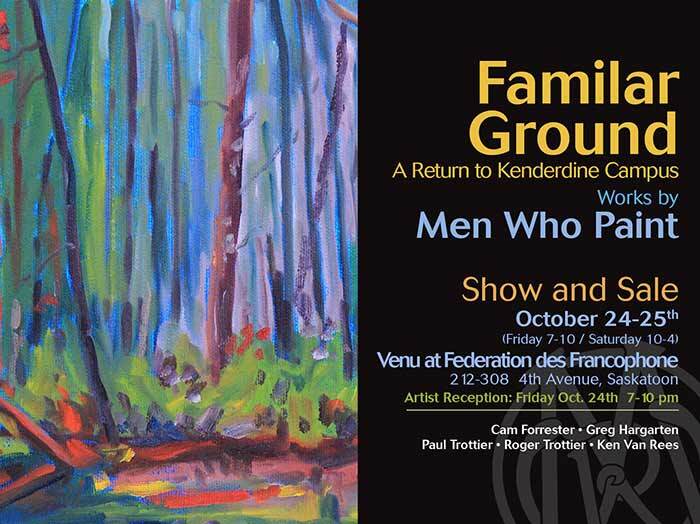 ‘Familiar Ground - A Return to Kenderdine Campus’ is a return to Men Who Paint’s roots so to speak. The exhibit features works painted around the now closed U of S Kenderdine Campus and the lakeland area north of Prince Albert. The campus has been integral to the group’s history. It acted as a base for the painters as they travelled though Northern Saskatchewan from the group’s inception in 2007 until the campus closure in 2012. Including over 60 works, “Familiar Ground - A return to Kenderdine” highlights the northern Saskatchewan areas of Emma Lake, Christopher Lake, Anglin Lake, Prince Albert National Park and La Ronge while paying tribute to the place that first brought the group together. Since their formation in 2007, Men Who Paint have embraced plein air painting. Inspired by the work and adventurous spirit of the early Canadian painters, the group, until recently, has spent most of their painting time outdoors. Their travels have seen them at many Canadian locations, including Banff National Park, Ontario’s Algonquin Park, Ellesmere Island and Yukon’s Ivvavik National Park, as well as Saskatchewan locations Prince Albert National Park, Emma Lake, La Ronge and Cypress Hills. Their work is held in private, corporate and museum collections including The Mann Gallery in Prince Albert and the Parks Canada Permanent Collections. Emma Lake became an important centre for Saskatchewan fine art, when in 1935, the University of Saskatchewan established an art school on Murray Point. The school attracted artists to the lake, including notable painter Ernest Lindner, who built a cabin on Fairy Island. The Lindner cabin and the Murray Point Art School were later joined to form the University of Saskatchewan’s Emma Lake Kenderdine Campus. Building on the art tradition of the area, Regina artists, Arthur McKay and Kenneth Lochhead, both members of the influential art group the Regina Five, organized summer workshops at Emma Lake in 1955. The workshops brought together artists from across the province and the country in an effort to relieve the sense of isolation many Saskatchewan artists felt practicing their crafts in the province. The location also provided artists with a pristine boreal environment to draw on for inspiration and subject matter. The workshops were successful and Emma Lake became a significant place in the Canadian art scene, as hundreds of artists participated in the workshops as students and teachers.